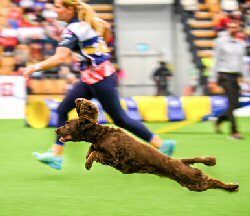 From the time that Kathryn Stickney started out in agility in 2012 with her dog Working Cocker Spaniel Coco, she dreamt of running at Crufts. Then she didn’t even know there was such as thing as the Agility World Championships (AWC), let alone believe it would be possible to compete there. It shows that anything is possible with hard work, dedication and, of course, a little bit of luck! 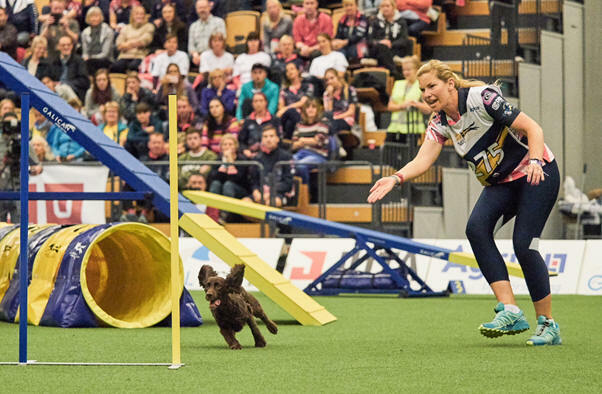 This is the story of their journey to the 2018 FCI Agility World Championships in Sweden. Coco and I have achieved so much since we started in Grade 1. In that time, she has won two Championship tickets and we have competed at Crufts and Olympia where Coco had a 2nd place in our first year there. While these events are incredible, the FCI Agility World Championships is unique and unbelievably special. I went to Italy to watch in 2015 and got so involved with every run. Even the eliminations are cheered and applauded as the partnerships show off their skills as they continue complete the course, a real celebration of world class agility. That's when I knew I wanted to get Coco there! Absolutely nothing can prepare you for your first time competing at the FCI Agiity World Championships. The atmosphere is electric with every single person in the crowd willing you on. The Agiity World Championships in Kristianstad, Sweden on 4th -7th October was my third consecutive AWC and definitely the one I felt the most ready for. My preparation this year has been the most strict and planned of any year I started working on my fitness and diet in November 2017 ready for the squad process and team selection. From June 2018, I planned and prepped every meal. I did several workouts a week along with hill running, sprint training and, in the process, lost a stone in weight. All this increased my energy levels, reaction time, speed and also had a positive impact on my mental game! Coco has been fantastic throughout this year and was possibly the fastest she has ever been which was not expected considering she is now eight years old. Happily I work with a great team of people (Nicky Grant ACPAT Physiotherapist & SMART Vet Wales) to keep her fit, and they have done a brilliant job with her. Over the four days prior to the show, we were busy with the official vet checks, measuring and team training on the day before. Team training was our opportunity to get into the Kristianstad arena for the first time and practice on the official equipment for the event. As the Small Team Captain, I also had some extra team responsibilities which included finalising the running order, planning training sessions for the team and ensuring we worked together as a team. This year was the first time at AWC for the rest of my team it was good to be the experienced one but they made it easy for me and it was a great team to be part of. Despite only have one run per day, the event itself can be mentally and physically exhausting. We were getting up before 5am everyday so we could be at the venue to cheer all the GB teams on but on the day, by the time the Small Team ran, it was late afternoon. Thankfully for me, my Small Individual runs were first. Knowing what's best for your dog is important. For instance, Coco settles well in her bed so she was happy in the team room but some dogs were better back at their hotel or resting in vehicles. The positives are that we had some great bits and she looked so fast out there. She went up several gears on that surface, but mix that with the cheering crowd, the fastest courses we have ever run and the adrenaline, it was hard for me to control her. She can be crazy and she can be wild but that is also what makes her so damn fast and fun to run. I have to keep connection with her the whole time or in the blink of an eye she has made her own choice of obstacle. To leave Sweden with no clear runs and only eliminations is tough especially after all the work we put in but that’s agility. Yes, I have been disappointed with how we did this year, but I am also proud of our achievements to date.The support we get as part of the team is incredible the coaching team are with us every step of the way before, during and after the events. Since then I have decided that Sweden was to be Coco's last international event. I will miss the people of Team GB just as much I will miss the competing but hopefully I will be back one day! Kathryn Stickney's love of dog sports started with Flyball when she got my first dog Harry, a naughty rescue Cockerpoo who is eleven years old now. Coco, a working cocker spaniel was my first agility dog and started her love of agility. She now has Crave who is four and reached Grade 7 this year but recently retired due to having Intervertebral Disc Disease and finally a 2 year old border collie called Wiggy who is just starting out in Grade 3. Agility has taken over Kathryn's life. She started teaching part-time in 2013 but after two years it became her full time job and she now runs KS Training where she teaches classes at levels and ages. She runs workshops, camps and guest trainer days and also teaches on training days nationwide. Kathryn is based in North Tawton (Devon).